Mary Muhongo and Meshack are pupils at Hondolo primary school, Shinyalu constituency where WEWASAFO is constructing Rain water harvesting tank and VIP latrines. The school was prioritized as a needy school in terms of water and sanitation after WEWASAFO wash team conducted a baseline survey. The two pupils come from a family of twelve children and almost all of them have been infested by jiggers. Mary is the ninth born in the family. She is fourteen years old and in class two. Mary has a mental problem that is why at her age, she is still in class two when she is supposed to be in class eight under normal circumstances. The teachers in Hondolo Primary School said that after teaching they need some time with her to make her understand better what others have learned. She is the daughter of Paul Lumwanji and Selina Spoon. Mary has been at Mukulusu Special School for children with special needs. 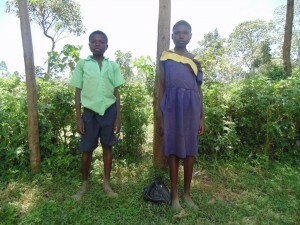 She had to drop out of school due to lack of school fees. Due to poverty, her parents were not in position to raise the required amount of fees and other special tools needed to support the young girl. Meshack Ambani (in the picture above), Mary’s brother said their mother has been sick for the last three years, so they are forced to do domestic chores after school. That contributes to their poor performance in school. Their parents are all jobless and that makes life harder for them. The Deputy Head teacher of the school admitted that life has never been that easy for the family. They used to live in a grass thatched house which leaks terribly during rainy season. Because of this, community members were forced to contribute to build a roof over their heads. He further stated that their parents are not able to pay five hundred shillings (roughly $5.50 USD) for their three children Mary, Meshack and Eddah who are at Hondolo primary. “I remember one day when Mary fainted. We immediately administered first aid and when the parent was called she admitted that they never had supper the previous night and also breakfast that day. It was so sad.” the deputy head teacher said. He also admitted that the cases of jigger infestation in the school are on the rise and he is appealing for help because the school is still young and the parents around the school are poor. “Water will soon be available in the school and I hope this will improve the sanitation in the school and the surrounding community”. The deputy Head Master added. When you invest in The Water Project, you're investing in people like Mary and Meshark. Your gifts help us reach more communities with the gift of clean, safe water. And every drop helps unlock potential.